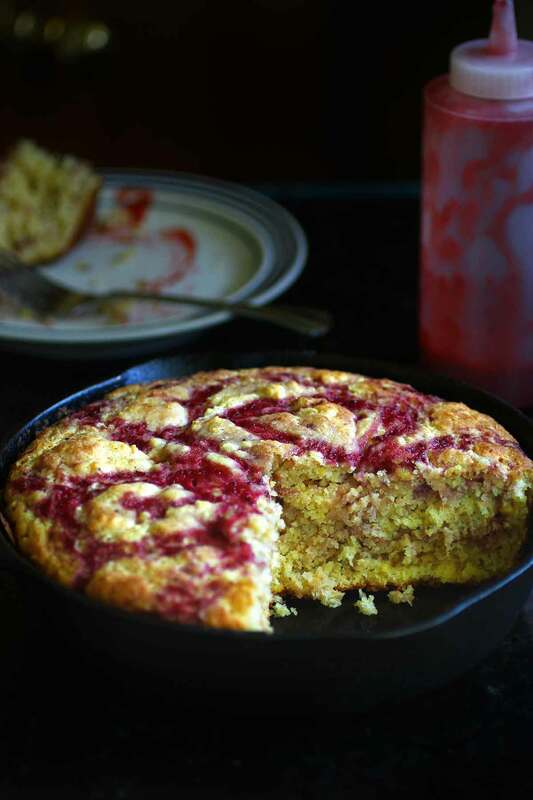 Tender moist cornbread swirled with fresh strawberries and honey. 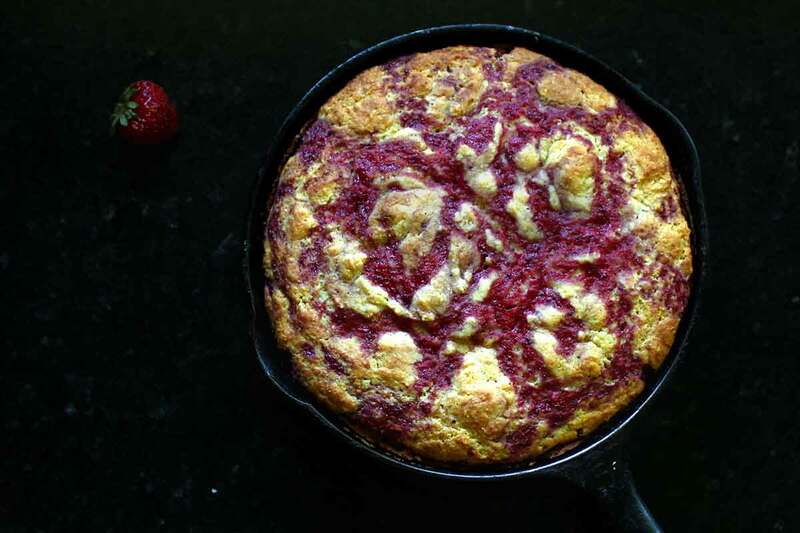 The strawberries, in addition to adding a whole new level of yum to the scent of baking cornbread are also the perfect foil for a tangy vinegar barbecue sauce. Delicious slathered with butter and topped with some of the remaining strawberry sauce. Sub this out for shortcake (perhaps adding just a smidge more honey) and top with more strawberries and whipped cream for a cornbread twist on strawberry shortcake. I have been dreaming about this cornbread for days now. I bought a half flat of Hood strawberries at the farmers market and they just don’t last like other varietals. Still delicious but not so pretty (I’m sure the ride home on the back of my scooter didn’t help much) the Hood strawberry when slightly soft makes an amazing sauce so amazing I couldn’t help but reserve a bit to add to the cornbread after baking. Throughly Combine flour, cornmeal, salt, and baking powder in a large bowl. Mix the yogurt, milk, and baking powder together in a medium bowl. Add the egg and the butter/honey mixture and stir to combine. Add the butter or bacon grease to the preheated skillet, swirling to coat. Bake until the center of the bread is firm to the touch and a toothpick comes out clean- about 20-30 minutes depending on the size of your skillet, larger skillet=faster baking. Serve warm with remaining strawberry sauce. Never seen such a creatively flavoured cornbread before. Love it!